Description: Briefly speaking — a hysterical picture book about animals in their underpants! "There's a new zoo in town, and here's what I've heard . . . 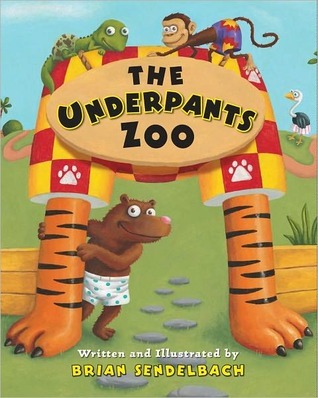 THE UNDERPANTS ZOO is completely absurd." What kind of underpants does a lion wear? What about an elephant? The answers to these questions will have readers laughing and turning the page to find out more! Bestselling illustrator Brian Sendelbach has created a wonderfully funny and wacky world that will charm readers of all ages. Jake's Review: The illustrations are really, really funny. It is a kiddie book not for boys like me (mom's note: Sure Jake I totally saw you laughing) but I think Jesse would really like it and my Mom because she is so silly. I did find it funny because I am a boy and we boys like this potty humour sort of stuff. I really liked the part with the camel because he looked so funny with his pants full of sand and trying to hold them up. I didn't like the picture of the hippo because it was way too girly. Mom's Review: Wonderfully bright and colourful illustrations will amuse young and old. The illustrations are charming and silly and will bring lots of laughs. The prose is simple, short and easy to understand so it is perfect for beginning readers as well as for reading aloud to younger children. This was a huge hit by all of us here in the Rayment household, even my little anti-reader Jesse liked to flip through the pages. Perfect for boys (and immature Mom's) of all ages since dudes it is about animals and underpants - that is funny stuff. Would recommend it for public libraries and especially for story-times. I predict lots of giggling! My son would LOVE this. He loves Captain Underpants, so thanks Jake for the heads up!